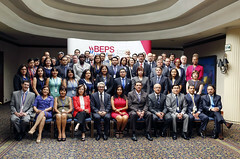 03/03/2015 - Following the release of the Strategy for Deepening Developing Country Engagement in the BEPS Project in November 2014, the Latin America and the Caribbean Regional Network on BEPS held its meeting on 26 - 27 February 2015 in Lima. 89 senior tax officials from 14 jurisdictions and 7 international organisations participated in the event, which was hosted by SUNAT. Discussions focused on BEPS issues of particular relevance for the Region, such as commodities transactions, interest deductions or the difficulties in finding adequate transfer pricing comparables, and the development of toolkits to assist the implementation of solutions to counter BEPS. Business and civil society representatives participated in selected parts of the meeting and provided their regional perspectives on the BEPS Project. The Co-Chairs of the meeting, Mr. Marcio Verdi from CIAT and Mr. Richard Llaque from SUNAT developed a summary of the discussions, highlighting the key outcomes. These will be discussed at the meeting of the Global Forum on Transfer Pricing and the Task Force on Tax and Development on 16-18 March 2015 and will feed the development of the BEPS outputs by the Committee on Fiscal Affairs and its Working Parties.